Casa Herrera full flow continuous fryers are constructed to the highest demanding standards and are the industry's most advance models. Heavy-duty and reliable, they incorporate every feature necessary to deliver dependable production of tortilla chips, corn chips, corn nuts, other nuts, peanuts, pellets, churros, and a long list of other snack foods and fried processed food items. We offer more options than any other competitor, all stainless construction or combination, indirect fired, direct fired, single belt submerger, double belt submerger, adjustable submerger. All made for either buojant or non buojant products, expanding products, etc. 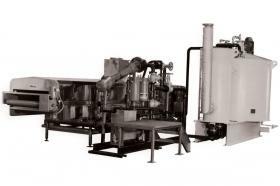 Continuous oil circulation system recycles 100% of the oil and filters it every minute. Precise temperature control and quick adjustments to product load changes. many options for filtration systems for continuous filtration, keeping fine particles in suspension for efficient removal, allowing for the highest oil and product quality. Submerger paddles and conveyors control dwell time and consistency. Automatic oil make-up and feed system maintains the proper oil level at all times. Clean in place (CIP) system simplifies sanitation procedures. It includes appropriate valving, piping, and discharge nozzles to direct cleaning chemicals to proper cleaning locations. Power hood lift with Hi-Lo sensors, for visual inspection of entire submerger and discharge while cooking. Discharge conveyor regulates product removal after frying. It includes adjustable speed controls for changes in product dwell and drain times.